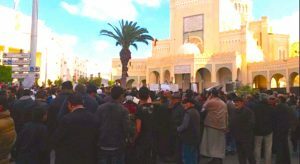 There have been furious protests from Misrata at the belief that the city is being demonised by various bodies in Tripoli, and in particular the hostility shown to the city by demonstrators yesterday in Tripoli’s Algeria and later Martyrs’ Squares. In statement, Misratan members of the House of Representatives and of the State Council said they were suspending all contacts with the Presidency Council (PC) until there had been an apology for the inflammatory statements from the crowds yesterday, before they were driven from Martyrs’ Square by gunfire. The Misratan lawmakers pointed out that the PC had condemned the violence used against the protestors, backing their freedom of speech but had not condemned what they actually said. “What happened yesterday is not freedom of speech but an incitement of hatred and violence against the city of Misrata,” they said. The Presidency Council’s statement had condemned the attack on the protesters, saying it was a violation of freedom of speech, and ordering an investigation by the the Attorney General and the arrest of the attackers. Misrata municipal council has also condemned both the criticism of the city in Tripoli’s Martyrs’ Square and the subsequent PC statement for equating freedom of speech with “hate speech” against Misrata. It too said it held the PC fully responsible for the deterioration of the situation in the county. Separately, there have been public protests at what happened in the capital and at other perceived anti-Misrata moves there. A substantial group of Misratan revolutionaries and their supporters gathered at the Dafniya checkpoint west of the city, on the road to Tripoli, and forced its closure. In a statement broadcast on the grand mufti’s Tanasuh TV, they demanded the mobilisation of Misratan “revolutionaries” against the “conspiracy” in Tripoli, which they claimed was being run by followers of Khalifa Hafter. The statements by the Misratan lawmakers and the municipal council are seen as not only a response to growing local anger that the city is being vilified elsewhere in the country, but also a move to prevent the more hardline forces in the city from using it to gain support and power. On Friday evening, local hardliners attacked the council offices demanding the resignation of the mayor and councillors. In its statement criticising the PC, Misrata council also condemned the attack, describing those involved as criminals driven by ideology and linked to “external parties seeking power”. In a related development, PC deputy chairman Ahmed Maetig, from Misrata, has cut short his trip to the United States because of the fighting in the capital. PC head Faiez Serraj has also cancelled his visit to Italy on Monday. He had been intending to join a summit of Mediterranean countries to discuss limiting migration. Meanwhile, the 218 TV Channel has announced that its journalists abducted last night were released today. The station had quickly withdrawn an early statement saying three of their reporters had been kidnapped. It is clear that the journalist were indeed taken but it is not clear how and why they were released so quickly.